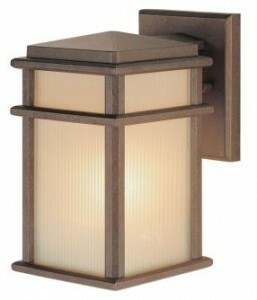 Many people have different ideas on what style of Outdoor Led Wall Lanterns would look good on their home. We will look at five different styles here and let you pick out your own style. All of these fixtures will need to be mounted on a switch controlled 110 volt electrical box. I will cover that more at the end of this article. If you are just looking for some pricing on your lighting needs use the following link. The Redding Station in the title of this fixture is in reference to its old Railroad type of design. A lot of people like this old style of down lighting. The all aluminum shade, availablein a Restoration Bronze(shown) or Tarnished finish, will direct you illumination down making this fixture dark sky compliant. This is important for some as it is a law some areas, check your local rules. The 14 watt LED bulb(included) is powered by an advanced LED Chipset for the best in reliability and performance. This LED bulb is able to be put on a dimmer for better results. This fixture is available in two sizes. A mounting plate of 4.5 inches wide by 6.5 inches tall, with the fixture 9.5 inches tall, shade 9 inches across and a total of 10.5 inches deep. A larger fixture has a mounting plate of 4.75 inches wide and 7.88 inches tall, with the fixture 12.5 inches tall, shade 12 inches across and a total of 13 inches deep. This box shaped fixture will come in two color combinations, Corinthian Bronze Finish with White Opal Glass(shown here) and Brushed Aluminum Finish with Clear Seeded Glass. You can choose a combination that will go well with your other decor. Features a 14 watt LED bulb (included) with the latest in LED chipsets to power the light. Bulb is replaceable. This fixture is California Title 24 compliant. The mounting block is 4.75 inches wide and 5 1/2 inches tall. The fixture is 9.25 inches tall, 5.24 across and will extend 7 inches away from the wall. This hanging Wall Lantern in an espresso finish and white opal etched glass shade will give you a old style carriage look. This fixture will hang from the mounting block, may need to adjust the height of the electric box as this fixture hangs lower that the rest. The 14 watt LED bulb (included) is powered by the latest in LED technology. The mounting block is 9.5 inches tall and 5 inches wide. The fixture is 9.5 inches tall and 4.75 inches across. It will extend 6 inches away from the wall. This round aluminum style fixture has a powder coated finish. 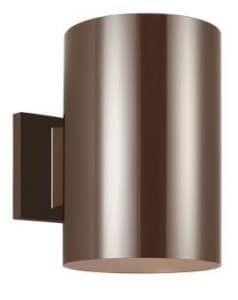 The finish is available in a Bronze(shown), White or Painted Brushed Nickel Finish. Clear Tempered Glass will cover the bulb on the bottom of the fixture. The modern style will blend in with many decors. The 28 watt LED bulb is included. Bulb should last about 50,000 hours under normal use, you should never have to replace the bulb. The mounting plate is 4.5 inches square. The fixture is 14.5 inches tall, 5 inches across and will extend 8 inches away from the wall. Maybe you would prefer the Nautical look of this fixture, it comes in two finishes Textured Graphite(shown) and Antique Bronze with an etched glass globe. The 9 watt LED(included) bulb will give you about 623 lumens of light. Bulb can be replaced and a dimmer can be used, just check directions on the specifications on what dimmer switches will work. The mounting block is 4.5 inches across. Fixture is 10.5 inches tall and 5 inches across. It will extend 7.5 inches away from the wall. This product is Title 24 Compliant. If you are just replacing an existing fixture, you work will be simple. If you are not comfortable with working with electrical connections, consult a qualified electrician. Make sure power is off, disconnect old fixture, mounting plate and wire connections. Replace mounting plate, reconnect wires(make sure to connect the same colors together), and then mount fixture, install bulb and turn power back on. If you are installing a new fixture, you may need to contact a qualified electrician. He would know the local rules and regulations on what is required in your location for this type of installation. Not all areas follow the same rules. After looking at this selection of Outdoor Led Wall Lanterns, I think you should have a better idea what will work for your lighting needs. Let me know what fixture you like the best and why. Thanks for reading my post and if you have any questions or comments please use the form below and I will get back to you. Great selection of light fixtures. I enjoy the “old time” look of these lights. The Redding Station light will be perfect for my deck. We just finished remodeling a Victorian style home dating back to 1906 and the light fits are decor perfectly. How long do the led lights typically last? Most LED bulbs will last about 50,000 hours. Only complications of an installation or power surge will make them go bad. Most will outlast the fixture that they are in. I really like the Dakota fixture for my more modern home. I has the old and new look. Man I love LED lighting, so efficient and so nice bright! I love the various styles of outdoor lights that you shared. My favorite would be the Feiss Dakota. The Dakota is also my favorite in this bunch. I has the modern look and will also look well in an older home. Led and solar lighting is the wave of the future. Nice post man! If you ask me what I like, I would answer the mission lodge lantern. I think it has a great design that give a picture of Japanese style of architecture. The others are pretty awesome too. The Mission Lodge Lantern is very popular with the more modern decors. It does have an oriental flair. Hey John thank you for the great information. 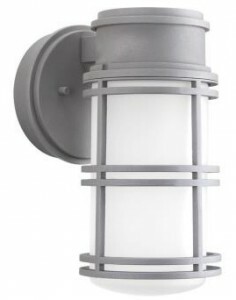 I would have to say I’m really liking the Feiss style wall lantern. It has a great color to it and it looks luxurious. Also thank you for the tips on changing out your wall lanterns, I would really hate to get shocked. Thank you again John for the great read! I just want people to be aware that they can do their own repairs and installs. Getting in over your head is easy to do if you have not done this type of install before. I have been doing this for years and still have a checklist to make sure I do not get myself into trouble. This is a great work! I enjoyed everything about it. The ideas you are sharing with your audience are very informative and persuasive. I will visit again and again. May all your efforts be rewarded again and again. Thanks for your comments. I will keep updating my list of post and share with the internet. I like those vintage style lamps that you posted. Where can I get those? Follow the links on the page that ask if you need more information on pricing. Because these are LED lights the price is a little higher than a regular incandescent bulb. I like the first light you have listed here as I have been looking to replace the light on my back deck as it is just the crappy builders grade stuff there now. My biggest concern with replacing our deck light though is that we like to sit out on our deck a lot over the warmer months and I don’t want a light that will blind us while we are out. Would you have any concerns with the Redding Station light in regards to that? Thanks. These lights fixture can be controlled with a dimmer switch. Each one will give the requirements for the switch type in the instructions. You can install the switch where the on/off switch is located. 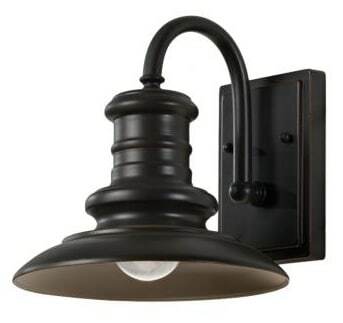 Replacing the on/off switch should not take much more electrical knowledge than installing the fixture, if you install the fixture you can install the switch. I absolutely love the LED outdoor wall when terms you’ve picked out. I think the fact that they are LED is a bonus in itself because it lends itself to be a bulb that never, or at least rarely, needs to be changed. No more dealing with cobwebs or being outside on a cold winter night when you realize your front walk is no longer being lit. 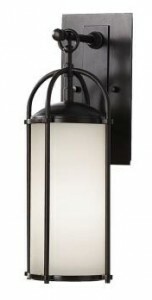 The Feiss Redding Station – 9.68″ 14W 1 LED Outdoor Wall Lantern looks perfect for my needs. No globe to wash the dead bugs out of. Talk about gross and distasteful for guests to see at your front door. Do you know if this particular fixture comes in many other finishes? I’m looking for something along the line of copper for at least with copper accents. because I plan to use this in my backyard. OK, now I’m off to find it an electrician because I have no fixture in the place that I want to put this. Looking forward to your answer and I thank you in advance. This fixture comes in a Tarnish finish that is a rusty looking finish. No Copper finish for this product. I did find some similar styles, not all LED fixtures. Follow to this page for more information on Copper Outdoor Led Wall Lanterns. Great selection you have there! Most of the lights we use at home are LED and these choices are really great. I personally like mission lodge because it has a very nostalgic ambiance in it! I would love to see for myself how mission lodge would look in our home. The Mission Lodge fixture is a very neutral color and design. It will go with a lot of exterior decors.